The hungry gap is the name for this time of year, when there are no fresh vegetables left growing in the fields and the stored food is used up or gone off. Not that in the modern era many people notice it, now that we can import food from all over the world, freezers keep food for years and the supermarkets are as full as ever. But for locavores (people who eat locally grown food), those who eat their own produce, or just if you feel that seasonal produce tastes vastly superior to forced or long distance grub, how do you get through the next few weeks? Tom Norrington Davies has some great suggestions in this article in the Guardian, using cauliflowers, leeks and rhubarb. I’ve noticed a few spring stirrings in the garden in the last week or so, with the chives and rhubarb starting to appear, and a few leaves of parsley seem to have survived all through the frosts of winter. I also like to keep a few things growing on the windowsill and the easiest gardening you will ever do is to grow mustard and cress in tubs and a few sprouted seeds in a jar. 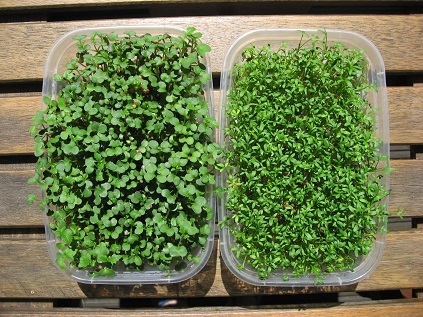 For mustard and cress, just line a couple of plastic tubs with some kitchen paper, soak the paper in water and sprinkle a fairly thick layer of the seeds over it. Keep the paper watered at all times, leave the tubs in daylight, then you’ll have some gorgeous, fresh sprouted greens in 1 – 2 weeks. I love the peppery flavour of the mustard and cress shoots and they’re surprisingly nutritious, with good amounts of vitamins A and C as well as B vitamins, magnesium, calcium and potassium. Add them to sandwiches of hummous or pate, sprinkle them on salads or use as a garnish on stir fries. Or try them as a simple salad with this lovely Honey Mustard Dressing. Put the mustard, honey oil and vinegar in a jar and shake until well mixed. 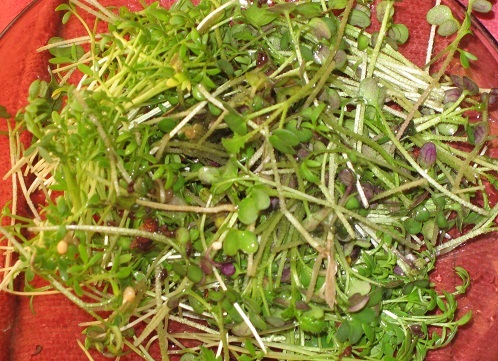 Season with salt and pepper, sprinkle over the mustard cress salad and serve at once. If you’re like me, then you’ll understand that skiing can often mean struggling down a slippery slope while experienced skiiers and small children whizz past at 350 mph! And if you’re a veggie then you’ll know that eating in the French Alps can be a similarly trying experience. 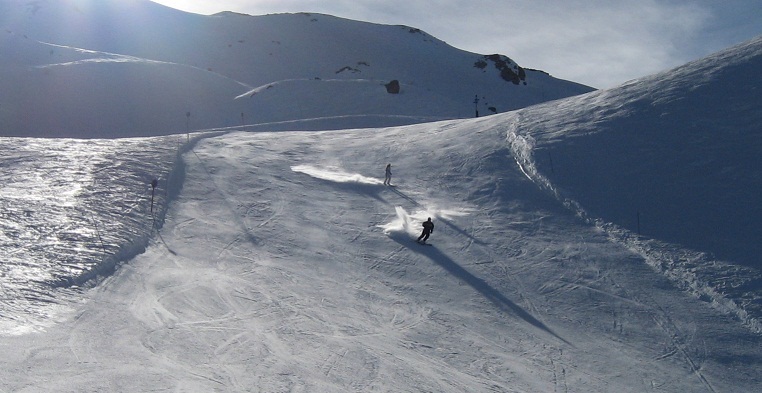 Well last week at Serre Chevalier, I managed some great fun skiing, despite the lack of snow at the time, all in brilliant sunshine. And it turned out that there are some excellent places to eat veggie food too! 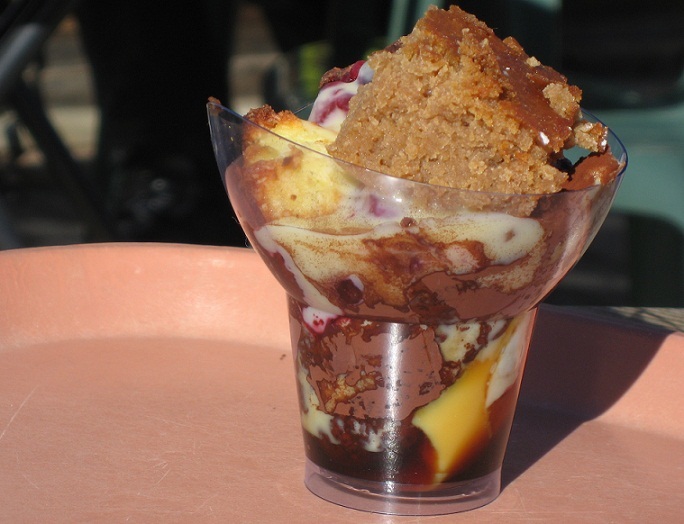 The best of the mountain restaurants was undoubtedly the Cafe Soleil at the top of the telepherique from Chantemerle. After discovery on our third day, we made sure we came over every day for our lunch. It is mostly a self- service restaurant with galettes and crepes, pizzas, paninis etc, as well as a wonderful salad bar and a dessert bowl – fill up your bowl from the selection of desserts available – see how it’s done below! 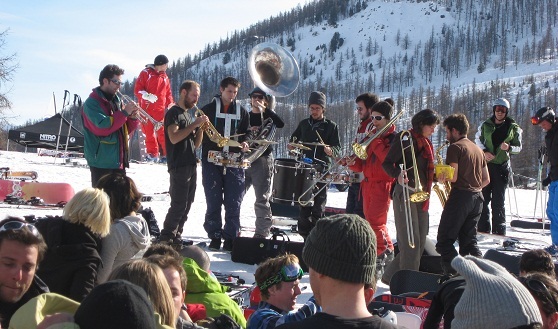 On our final day we were treated to a jazz band playing in the snow as part of the Briancon jazz festival. We lingered long over our lunch that day! In Chantemerle itself, we were treated to some fabulous haute cuisine at Triptyque, which lists it’s address as ‘en face de l’eglise’! The restaurant is in the centre of the old town, but has a modern interior and serves a modern inventive menu. To start we had Crumble Vegetarien, which was a creamy mousse of aubergine and goat’s cheese, topped with chunks of spicy crumble, served in a glass bowl. The main course was Wok Vegetarien, a less intriguing, but nonetheless excellent noodle dish with vegetables in a richly flavoured sauce. And for dessert we had Soupe d’Ananas, a whole new taste combination for me, which consisted of two layers of creamed pineapple, the first flavoured with ginger and the second with basil, all served with an excellent vanilla ice cream. This light dessert was a revelation as the flavours worked so well together, and I’m planning to work on a recipe for something similar! 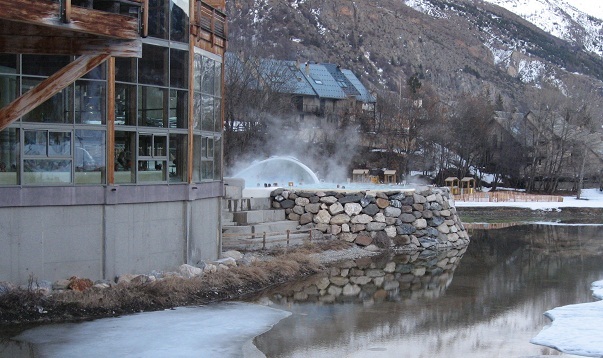 An important part of a ski trip to Serre Chevalier has surely got to be a visit to the spa in Monetier les Bains. The naturally heated mineral waters are now housed in a modern take on the traditional roman baths, with a large pool at the centre and a steaming outdoor pool. In keeping with the ancient Roman tradition there is also the opportunity to dip in and out of the different water temperatures of the frigidarium, the tepidarium and the calderium, as well as saunas and steam rooms. This was all wonderfully relaxing and set us up for an excellent pizza later in Brasera in the old part of town. The real log fire there was also welcome. We were staying in Villeneuve and in the old town of La Salle Les Alpes we enjoyed some great cooking at the British run Mojo on the Rue de la Guisane. They had a couple of veggie dishes, a Thai Red Curry and a Linguine. And over in the new Centre Commerciale in Pre Long, our favourite spot was the Jardin creperie, which we ate in a couple of times as it offered a selection of veggie gallettes and salads. 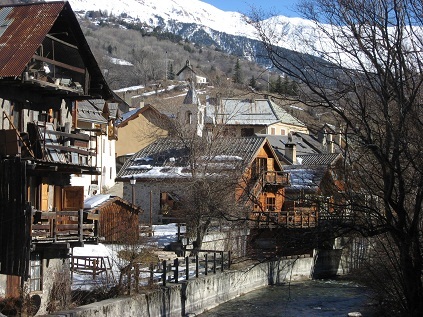 Serre Chevalier really lived up to it’s promise with beautiful old villages, great skiing and some really good food! 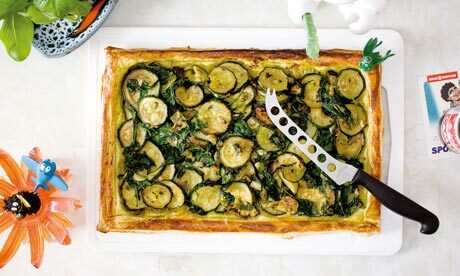 The Student Cookbook over at the Guardian newspaper’s website has a few good recipes for vegetarians and vegans, including this one, which includes a wonderful recipe for vegan pesto. Preheat the oven to 220C/gas 7. Trim the ends off the courgettes and slice thickly. Trim and slice the spring onions and wash the spinach, pick off the leaves and slice roughly. Heat the oil in a wok or large frying pan and start stir-frying the courgettes. Once they begin to soften, chuck in the spring onions and garlic, cook for a minute then add the spinach and stir-fry for a minute more until the leaves wilt. Season with salt and pepper, tip the vegetables into a baking sheet or roasting tin and leave them to cool. Take the pastry out of the fridge before you make the pesto. For the pesto: Wash the coriander and pick the leaves off the stalks. Whizz the cashews briefly in a food processor then add the garlic, blend again, then the coriander leaves and mint, and whizz until you have a rough paste. Gradually add the oil until the mixture has the consistency of a thick sauce. Season with salt, pepper and lemon juice. Unroll the pastry on to a lightly greased baking tray. With the point of a sharp knife mark out a rectangle about 1cm in from the edge to leave a border. Spread the pesto over the base up to the border you’ve made. Tip the courgettes and spinach over the top, making sure they don’t cover the border. Bake for about 20 minutes until well risen and puffy. Leave to cool for 10-15 minutes. Drizzle over a little olive oil before serving.